The purpose of this study is to document the along-strike early syn-rift history of the Lower Jurassic Carbonate basin of the Central High Atlas (Morocco) by combining sedimentological observations and high-resolution biostratigraphy. Six sections, each from the Sinemurian to the Upper Pliensbachian, were investigated along a 75 km-long transect at the hanging wall of a major fault of the Lower Jurassic Basin (i.e. the Tizi n’ Firest fault). Depositional geometries of the early syn-rift deposits were reconstructed from the correlation between eight main timelines dated by biochronological markers for a time span covering about 6 Ma. Depocentre migration was examined and accommodation rates were calculated at the sub-zone timescale to discuss the along-strike-fault behavior of the Lower Jurassic basin formation. The early stages of extension are marked by contrasted along-strike variations in depositional geometry thickness, depocentre migration and accommodation rates, leading to the growth of three independent sub-basins (i.e. western, central, and eastern), ranging in size from 30 to 50 km, and displaying three contrasted tectono-sedimentary histories. 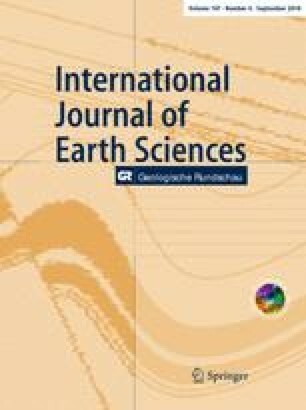 Our results suggest that, during the early rifting phase, tectonic activity was not a continuous and progressive process evolving towards a rift climax stage, but rather a series of acceleration periods that alternated with periods of much reduced activity. The length of active fault segments is estimated at about 15–20 km, with a lifespan of a few ammonite sub-zones (> 2–3 Ma). This work was supported financially by the French-Morocco “Action intégrée” MA 03/74, by the Burgundy Regional Council and the French CNRS. We are grateful to Carmela Chateau-Smith for proofreading the English. Useful comments and reviews from S. Bodin and J.-J Cornée were greatly appreciated and helped to improve the manuscript.